September 2017 – Jakarta, Indonesia: The largest sports media property in Asian history, ONE Championship™ (ONE), has just announced additional bouts for ONE: TOTAL VICTORY, set for the Jakarta Convention Center on 16 September. In the main event, former ONE Flyweight World Champion Kairat Akhmetov of Kazakhstan takes on Geje “Gravity” Eustaquio of the Philippines. In addition to the blockbuster headline bout, a series of compelling matchups have been put together featuring the absolute best in local and international martial arts talent. Former ONE Flyweight World Champion Kairat Akhmetov is a veteran martial artist from Almaty, Kazakhstan. The 29-year-old boasts a solid 23-1 professional record amassed during a stellar martial arts career which has seen him dominate his opponents with tenacious wrestling and powerful striking. In his most recent appearance inside the ONE Championship cage, Akhmetov faced divisional rival Adriano Moraes for the right to be crowned the undisputed ONE Flyweight World Champion. Akhmetov fell just short of victory, losing by unanimous decision in a close bout. 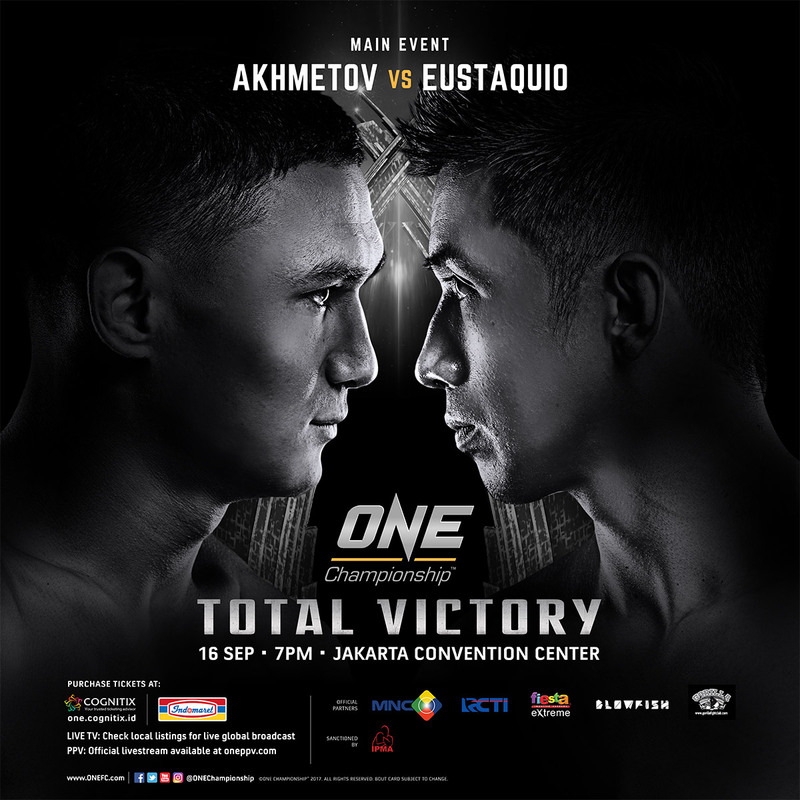 Determined to earn another shot at ONE Championship gold, a victory over Geje Eustaquio, whom Akhmetov will challenge in his next contest, could be the ticket to another title opportunity. Top flyweight contender and former world title challenger Geje “Gravity” Eustaquio of Baguio City, Philippines, is one of the most skilled martial artists in Asia, and a highly-decorated wushu practitioner. His solid striking and grappling skill set has led to huge victories over the course of a six-year professional martial arts career. Training in the high altitudes of the Philippines’ mountainous region, Eustaquio hones his craft alongside world-class teammates at the fabled Team Lakay. In his most recent bout, Eustaquio defeated fellow striker Anatpong Bunrad via split decision in a rematch. Known for his incredible ability to keep calm in the face of adversity, Eustaquio is set to headline ONE: TOTAL VICTORY opposite former ONE Flyweight World Champion Kairat Akhmetov. Top Indonesian prospect Stefer Rahardian impressed in his ONE Championship debut by winning the ONE: TITLES & TITANS Flyweight Tournament in August of 2016. Rahardian finished both Yotha Hutagalung and Hendrick Wijaya by first round rear-naked choke to become the tournament winner. In his last outing, Rahardian outperformed Eugene Toquero to win by unanimous decision in three rounds. Now unbeaten at six wins and no losses, Rahardian puts his unblemished record on the line against Sim Bunsrun. Sim Bunsrun is a 24-year-old KWC 3 Flyweight Tournament Champion currently competing in ONE Championship’s stacked flyweight division. He aced his first two assignments in the organization with flying colors, submitting compatriot Kun Sichan in December 2015 before outpointing Liu Peng Shuai a year later. Bunsrun now returns to the ONE Championship cage to go up against Indonesia’s Stefer Rahardian. Cameroonian Alain “The Panther” Ngalani, who trains out of Impakt MMA in Hong Kong, is an exciting heavyweight contender with massive size and brutish strength. With the agility and the quickness of a lighter competitor, Ngalani is a terrifying combination of size and speed and is always looking to end matches early. A former kickboxing titleholder, Ngalani now looks to surprise local fans in attendance with another spectacular performance as he takes on former title challenger Hideki Sekine. Japanese heavyweight Hideki “Shrek” Sekine holds a professional record of seven wins and one loss. He is a Brazilian jiu-jitsu black belt and has won multiple grappling tournaments across the globe. Known for his brute strength and technical grappling ability, Sekine owns three victories by submission and another three by knockout. In his last outing, he challenged Filipino-American superstar Brandon Vera for the ONE Heavyweight World Championship. Sekine looks to place himself back on the winning track as he squares off with Alain Ngalani. 25-year-old Yago Bryan of Rio de Janeiro, Brazil, is a former Shooto South American Strawweight Champion who took on former ONE Strawweight World Champion Dejdamrong Sor Amnuaysirichoke in his promotional debut. Skilled in both the striking and grappling arts, Bryan is making his way back to the ONE Championship cage, this time against Roy Doliguez of the Philippines. Roy Doliguez is a considered one of the best strawweights in Asia. Doliguez is also a former professional boxer with more than 40 pro bouts. He made his promotional debut in 2015, vying for the inaugural ONE Strawweight World Championship against Dejdamrong Sor Amnuaysirichoke. His next bout will be against a fellow former title contender in Yago Bryan. Indonesian martial artist “The Terminator” Sunoto is a WKF Indonesia Champion with a 6-3 professional record. With a penchant for grappling, three of Sunoto’s six victories have come by submission. The 32-year-old is known as an aggressive competitor who never backs down from a challenge. In his last bout, he scored a first-round stoppage victory over Cambodia’s Chan Heng. Sunoto looks to continue his winning ways as he is set to duke it out with Thai Rithy. 19-year-old Thai Rithy of Cambodia is a KWC Featherweight Champion who will make his ONE Championship debut as part of the promotion’s stacked featherweight division. He holds a professional record of five wins and two losses. Four of his five career victories have come by way of submission. Rithy is scheduled to make his first appearance inside the ONE Championship cage against Sunoto. Jeremy “The Predator” Meciaz is a 25-year-old Indonesian National Grappling Champion who made the transition to professional martial arts competition in 2017. In the same year, he made his ONE Championship debut against unbeaten Chinese prospect Chen “Rock Man” Lei. Meciaz now returns to the cage seeking victory, but will have to go through Hisyam Samsudin to claim success. Hisyam “Zephyrus” Samsudin of Malaysia is a former WBF Asia-Pacific Light Heavyweight Boxing Champion who trains at the highly-regarded Borneo Tribal Squad with Ann “Athena” Osman and AJ “Pyro” Lias Mansor. Samsudin likes to pepper opponents with heavy handed strikes, utilizing his world-class boxing base. Samsudin’s next assignment is against Jeremy Meciaz. “The Little Squirrel” Liu De Li Ge Ri Hu is an Inner Mongolia Wrestling Champion, holding a professional record of two wins and two losses. Liu De Li aims to make an astounding statement in his ONE Championship debut as he is booked to square off with Ramon Gonzales. 30-year-old Ramon “The Bicolano” Gonzales is a flyweight standout from the Philippines, representing Burn Soriano’s Hitman MMA. He has proven his karate mastery in competitions all over the world, but the former two-time Philippine National Kyokushin Karate Champion is determined to fully showcase his potential in ONE Championship. He will make his third appearance under the promotion’s banner against Liu De Li Ge Ri Hu. Liberian combatant Jerome S. Paye made his ONE Championship debut in February 2016 against China’s Li Hao Jie. In the bout, Paye showcased a well-rounded set of techniques, stifling his opponent with an array of striking combinations. With the ability to make bouts difficult for any opponent, Paye will make his return to the ONE Championship cage in Jakarta, Indonesia to face former boxing world champion Yodsanan Sityodtong. Former WBA Boxing World Champion Yodsanan “Little Tyson” Sityodtong of Thailand is known as a devastatingly powerful puncher, with the ability to utilize his heavy hands to stop foes with trademark combinations. With 47 knockouts in boxing and all three of his victories inside the ONE Championship cage ending in similar fashion, expect Sityodtong to always be on the lookout for an abrupt ending to his contests. Currently riding a two-bout winning streak, Sityodtong will be going for number three against Jerome S. Paye. 24-year-old Adrian Mattheis of Jakarta, Indonesia, is a martial artist competing in ONE Championship’s talented strawweight division. In the ONE: TITLES & TITANS strawweight tournament in August 2016, Mattheis defeated both Rustam Hutajulu and Roso Nugroho via scintillating knockouts in one night to be crowned tournament champion. In his next bout, Mattheis crosses paths with the debuting Phat Soda. 28-year-old Phat Soda is a three-time National Khun Khmer Champion. In his glory days as a Cambodian kickboxing competitor, he left fans on the edge of their seats with his lightning-quick and pinpoint striking. Soda looks to emulate his Khun Khmer success in ONE Championship as he steps in the cage with Adrian Mattheis. Kicking off the action at ONE: TOTAL VICTORY are two promising young bantamweight prospects. Striking specialist Riski Umar takes on compatriot Adi Nugroho in a three-round contest. Umar is set to make his professional debut in his first ONE Championship stint, while Nugroho is determined to have his hand raised in his second appearance under the organization’s umbrella.